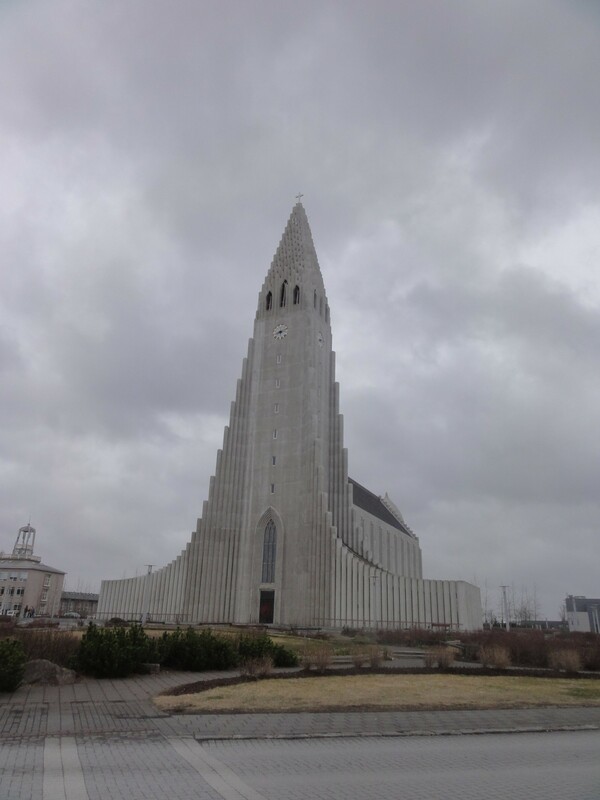 As the shuttle driver from SADCars spirited me away from the Reykjavik airport, he asked the question that, apparently, most Icelanders ask when people come to visit: Why Iceland? The answer is, I don’t know. While most people jetted off to balmy Sri Lanka or blossomy continental Europe for Easter holiday, I felt inexplicably drawn to the world’s northernmost capital and its miles of surrounding landscape. For once, I forsook the chance to enjoy spring and headed up toward the Arctic Circle to shiver my way through seven days in Iceland. And it was absolutely amazing. Part of the allure has to be the raw and vast terrain: jagged mountain peaks, black sand beaches, miles of mossy rocks, grassy plains, and sleepy volcanoes, a large number of which are overdue to erupt. (Adds a little element of uncertainty to the whole trip.) There would be ice, snow, reindeer, whale, and ponies. Hot springs, mud pots, lagoons, and glaciers – and I wanted all of it. And there’s the fact that 50% of the population believe in elves, to the point where they will alter construction plans if they interfere with land where the hidden people are believed to dwell. One of the major reasons, though, the one that may have fueled my desire for the whole trip in the first place, was the Northern Lights. Since I first read about them and saw photos in schoolbooks, I’d always wanted to actually see the spectacle of the Northern Lights, and Iceland seemed as good a place as any to do this. In the weeks prior to my trip, I’d spent each day obsessively checking the aurora forecast in hopes that they would be bright and the sky would be dark enough to see them. What made the trip even better was that I’d originally booked it on my own, having asked a number of friends to join and having them decline, but Jamie had decided to come along. We’d never traveled together, so this was an exciting turn of events. …because they might blow off? I was grateful that the car was a sturdy, 4WD Suzuki equipped with a GPS and an odd little mini-gear shift that I hoped we wouldn’t have to use. * I rolled into Reykjavik around 6pm and, with about five hours to kill, sped off to a little restaurant downtown that I’d watched in the Unique Iceland documentary on board the aircraft. 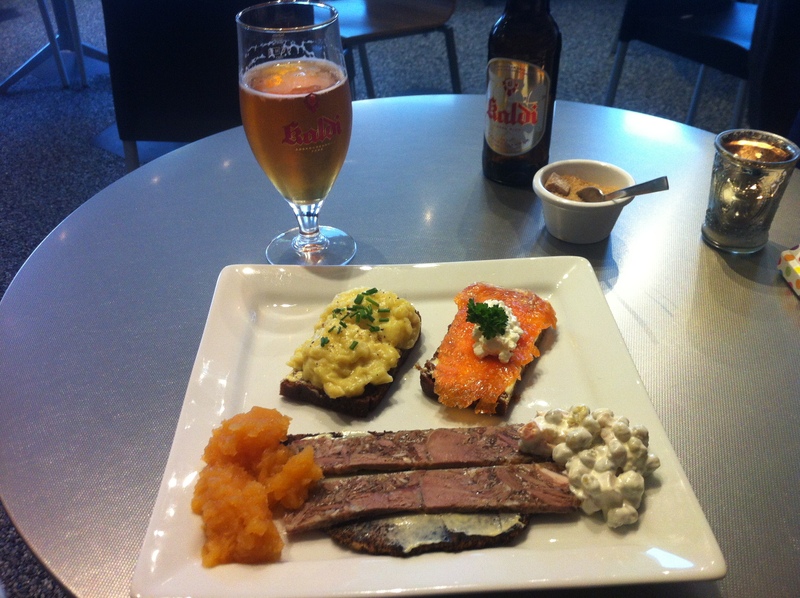 At Cafe Loki, I decided to dive right into Icelandic cuisine. My server recommended a traditional dish: rye with mashed fish, rye with smoked trout, sheep’s head jelly on flatbread, and pea salad with turnips. (It was super filling.) I topped it off with a crisp, cold Kaldi, an organic beer I’d also learned about in the video. It was delicious and warm, snug in the cafe while the sky clouded over and the wind pummeled the windows. The sun stayed out until a little before ten, but when I picked Jamie up at the airport an hour later, it was still cold and windy. It didn’t matter. As we drove back to Reykjavik, passing roadsigns bearing images of viking helmets and dancing elves, I felt completely invigorated by the fact that we were in Reykjavik and had eight days ahead of us to drive around the island. Haha more to come! Don’t you worry!